JConcepts introduces a high-glamour wheel for 2.2” Monster and Scale competition. The Midwest wheel, is a detailed replica of one the greatest monster wheels from the early to mid 1980’s. Starting with the popular 2.2” mounting bead diameter, JConcepts went to work creating a one-piece, light-weight option which is packed with versatility and durability. 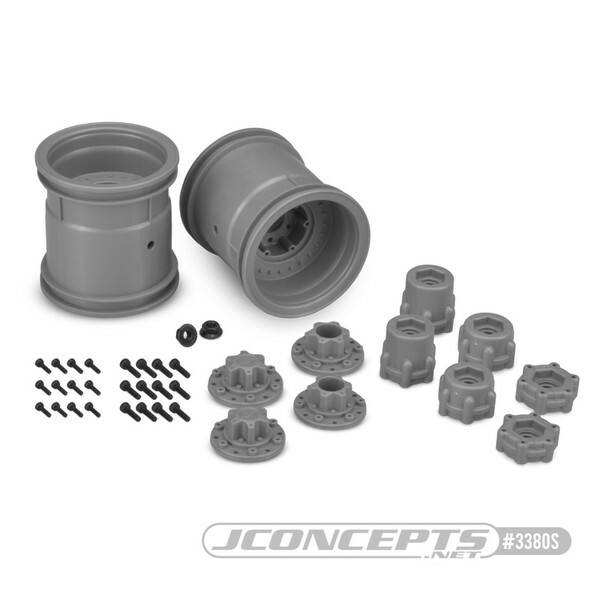 The Midwest wheel has been designed to work in conjunction with JConcepts #3179, Rangers tire combination. With a list of design considerations, the team went to work on a simple design that was first stout and second versatile. It was important to incorporate an adaptor which could alter the off-set but also maintain a certain look for a variety of popular vehicles on the market. The stepped design of the perimeter of the wheel reduces weight but also adds rigidity for the ultimate bash and play wheel. The Midwest wheel includes three off-set wheel adaptors. 11mm width for a stock Clod Buster or retro type Monster Truck width, 18mm for increased stability on vehicles such as the Stampede, Stampede 4x4, Rustler, Slash 4x4 and 25mm for the ultimate in footing for long wheelbase racing monster trucks. The adaptors are installed with 6 x 2.5 x 12mm screws and centers precisely on the wheel for positive engagement. The wheels include open and closed lock-out hubs which attach with 6 x 2 x 8mm screws. The lock-out caps support a scale look as well as a quick change racer function to suit individual needs. Also included is a pair of steel, serrated, 4mm thin pattern lock-nuts for greater security. The Midwest wheels are available in white, black and silver colors to match any color scheme or realistic build. Step up with the ultimate in looks, performance and versatility with the Midwest 2.2” wheels by JConcepts – World Proven Innovation and Design. Note: These wheels are NOT designed to fit Clodbuster sized tires and will NOT work with the larger Clodbuster tires. Shipping Charges: Our standard shipping charge is $6.50 for the 1st item and $2.00 for each additional item purchased. This product was added to our catalog on 01/28/2019.